A traditional English ballad from the seventh century, it is said to have been printed first in a kind of early newspaper, a broadsheet. The text tells the story of a young girl who moved to London from the ‘North Country’ and is homesick for the familiarity of her life there. 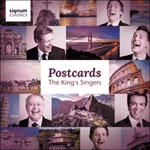 This beautiful arrangement by Gordon Langford dates back to the early days of The King’s Singers. Although with her nature it did not agree. 'How I wish once again in the North I could be! Where lads and young lasses are making the hay. The meadows are pleasant and maidens are gay. And tarry with me in my North Country home.